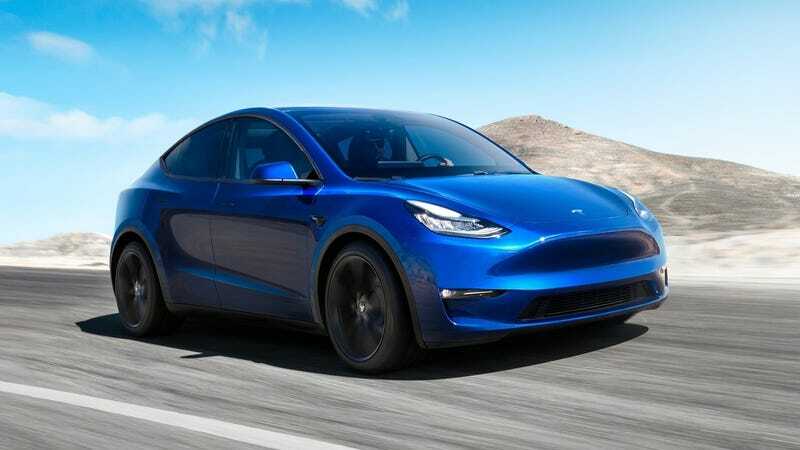 After the Tesla Model Y reveal last month, in which Musk took a 45-minute victory lap talking about how, in his telling, he was able to build a successful electric car company when nobody else believed he could, it was hard to tell why this event even took place. Why hold a giant, showcase event for a new car that isn’t even that new just to talk about how great you are? After the week Tesla has had, it now makes a little more sense. Musk, in anticipation of bad but expected news, wanted to remind people that he’s proven the doubters wrong before. And he thinks he can do it again. Indeed, Tesla has had a very rough week. Its stock plunged almost 11 percent on news that vehicle deliveries dropped by more than 30 percent in Q1 2019 (it recovered slightly but is still well below the week’s opening price). Even though deliveries were more than double what they were a year prior, and the first quarter always sees an industry-wide drop—GM, Fiat Chrysler, and Ford were down 7 percent, 3 percent, and 1.6 percent respectively—the drastic reduction spooked investors. These troubling figures only exacerbate months-old concerns that Tesla is in the midst of a massive transition that could determine the automaker’s future. Rather than overextending itself in short bursts to achieve self-imposed goals, the electric car company is trying to become a sustainable industry leader. That’s a very different task than moving fast and breaking things. The word that investors and analysts tend to come back to when talking about Tesla is: demand. But they’re not really talking about demand. They’re talking about Tesla’s ability to tap into it. They’re talking, in other words, about Tesla’s managerial competence. There are two ways, in this context, to increase demand: expand to new markets or lower the price. These new delivery figures concern investors because they indicate Tesla is struggling to do both. Pretty much every article on the subject notes Tesla is struggling to physically deliver vehicles to buyers, mainly the Model 3, because it only produces them in one factory in California. This poses obvious yet significant logistical problems when you’re trying to send more vehicles to Europe and China. Tesla plans to build a battery-making Gigafactory in Shanghai. That won’t solve anything any time in the very short term, but it will have to borrow heavily to fund, putting additional financial pressures on the company as it sells more and more lower-margin Model 3's than high-margin Model S’s and X’s. As for the price question, Musk himself admitted it’s been “insanely difficult” to get the Model 3 down to $35,000, the magic figure he largely invented himself and tried to achieve via an army of robots in a tent before finally admitting humans are underrated. But few people are buying a Model 3 for the lowest price point since this gets you the least range, no Autopilot, or any color other than black. In itself, selling $8,000 in software add-ons, as the complete Autopilot package costs, is a great thing for a business since the cost of each additional Autopilot sale is functionally $0. The problem is if that price in itself removes the Model 3 from the market you’re trying to hit, or if the company actually loses money on the car sale if the customer doesn’t buy it as some analysts have estimated. These concerns are exacerbated by the fact that the company ran out of the $7,500 federal tax credits for EV purchases. It’s weird to have a CEO of a major car company trying—and kind of failing?—to explain the economic concept of demand to investors as if they’re bored high school students. Along with his entire management style and apparent deep-seeded paranoia, it begs the question of whether Musk is the right person to lead Tesla into its next, more mature phase that is less about cultivating a personality cult and more about running a sound multinational corporation. Investors, as with most humans, have a way of saying things without actually saying it. In this case, ‘demand’ is short-hand for expanding market reach, which at this point for Tesla means not so much building newer or different cars—they’re already some of the sleekest, most technologically-advanced and attractive products on the market—but doing all the little things that mean it can offer them at an increasingly lower price to an increasingly larger portion of the globe. Those are not problems that get solved by shouting at people, firing folks at random, or stalking whistleblowers, all managerial traits Musk has repeatedly been accused of inhabiting. They certainly aren’t problems that get solved by abruptly announcing you’re closing all your retail locations only to backtrack days later, justifying both decisions based on dubious statistics. Certainly, investors are worried about delivery figures. But it hardly requires deep study of the company’s volatile stock price to to realize they’ve been spooked for a while, worried it would eventually show up in the company’s fundamentals. That time has come, and it will take a savvy businessman who understands manufacturing and supply chains to usher Tesla into the next phase. The question that Tesla’s future depends on is whether Musk can be that.